Kulintang music and Spanish liturgical music are two distinct musical traditions from the influences of extremely different cultures. During the pre-colonial period, Filipinos already had rich musical traditions. In the Southern Philippines, particularly among the Magindanaon-Maranao and Tausug-Samal-Yakan peoples, “the kulintang ensemble is often considered as the most cultivated of the region’s musical expressions” (Hila 1989). 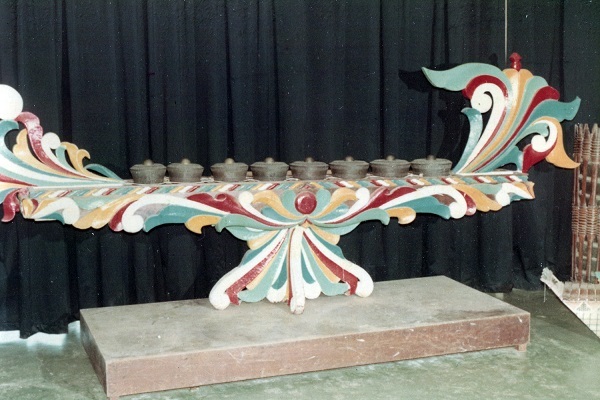 The kulintang refers to an ensemble of gongs laid in a row. It consists of seven, eight, and as many as twelve gongs diminishing in size. It is the kulintang instrument that provides the melody, and it is supported by other instruments such as the gandingan (a set of suspended gongs), dabakan (goblet-shaped drum), and other gongs such as agong and babendil. These other instruments “act as drones constantly repeating a particular rhythmic pattern for the duration of the music” (Hila 1989). Kulintang music is usually heard in festive gatherings, official celebrations, rites and rituals, weddings, and entertainment especially for respected visitors. Its artistry is “considered comparable to the urban and court music of Europe and Asia” (Maceda 1977). It is a musical concept that is believed to have come from outside Mindanao and Sulu and is closely associated to Southeast Asia. The style of kulintang performance varies in different parts of Mindanao. More than a medium of entertainment and hospitality, kulintang music also serves as a “vehicle for social interaction and group solidarity” (Hila 1989). On the other hand, along with the Spanish colonization of the Philippines came the influence of Western musical tradition, particularly through liturgical music. “History relates that the Filipinos’ first encounter with Christian religious music was during the Easter Sunday mass on 31 Mar 1521” (Javellana and Brillantes 1994). Friars utilized music as “an entry point in their task of evangelization” (Hila 1989). In 1596, the Spanish educational system was established which required Filipinos to play musical instruments such as the organ and flute, among others. Children and natives were gathered and taught the rudiments of Western music to sing in liturgical services, and when training was completed, they were tasked to teach others as well. In 1601, the Augustinians, the first missionaries to arrive in the Philippines, set up the first orchestra in the country, particularly in the Convent of Guadalupe. Religious orders organized the schola cantorum (school of singers), and the escuela de tiples or boys’ choirs. Among the notable Filipino musicians during this age of church music in the Philippines is Marcelo Adonay. Butocan, A. (1987). Palabunibunyan: a repertoire of musical pieces for the Maguindanaon kulintangan. Manila: The Philippine Women’s University. Hila, A.C. (1989). Musika: an essay on Philippine music. Manila: Cultural Center of the Philippines. Javellana, R., & Brillantes, M.P. (1994). Liturgical music. In CCP encyclopedia of Philippine art. (vol. 6, pp. 96-100). Maceda, J.M. (1977). A tradition of gongs and lutes. In Filipino heritage: the making of a nation. (vol. 3, pp. 772-776). [Manila]: Lahing Pilipino Publishing. Maceda, J.M. (1998). Gongs & bamboo: a panorama of Philippine musical instruments. Quezon City: University of the Philippines Press.